Dechion wrote a great post about inflation. He is right about the fact. The same objects that cost an arm and leg back then are now affordable by most, without their nominal price decreased. The epic ground mount is still 600G (excluding reputation discount) and the mount is still 100G, like two years ago, but while they cost weeks of farming back then, now it's 3x1.5 hours at the Isle of Dailies. He is right about the reason. "A low level character that can manage to gather 25-30g worth of stuff in a couple of hours play, and a level 70 that can plow through 250g worth of daily quests in the same amount of time." He is right about the conclusion: "Soon, very soon, what seems expensive to you now will seem like chump change." He is even right about the moral of the story: "Inflation is your friend." What he is wrong about is that inflation is "wrong" in the real world and it's different than in WoW. The inflation is exactly the same in WoW, than the real world. It is caused by exactly the same reason! It's true that years ago a house cost less than now a car. But wait! What kind of car was that? It was noisy and slow and lacked air conditioning, ABS, ESP, automatic break assistant, navigation, airbags, planned chassis folding, catalyzer, MP3 player and so on. If a car of our own time would be time-transported to the sixties, how much would it worth back then? Today's ordinary car, the one you ride, would be a miracle and millioners and oil sheiks and barons would bid millions to own this unique. Our industry "leveled up" several times during the time, creating more and more, better and better items with less effort, just like a lvl 70 can farm more items or craft better ones than a lvl 10. He says: "[in the real world] It forces us to try to make the same amount of incoming money cover the ever increasing costs of living." No! If you make the same amount of money like last year, you did not leveled up and deserve to get less value! If you stay lvl 20 you won't make more money! 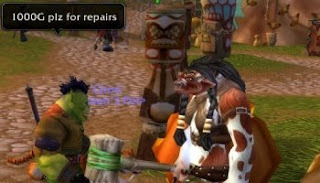 In WoW leveling, and even on max level gearing up is obvious. In the real world, unfortunately not! Which "stats" of yourself you increased the last year? Have you learnt new skills, new "recipes"? If not, while others did (GDP increased), they got ahead of you, like a HC player over a casual. It's completely OK that they get more value than you. WoW is a simulation of the real world, since it's played by real world people. If you are unsatisfied by your current salary, stop whining "years ago my salary was good", it's exactly like "a year ago my full T3 was awesome"! Stop raiding AQ40! Level up, learn new skills, respec if necessary and go to a new instance! PS: Evander pointed out that while prices increase, AH deposit costs do not, so their effect decrease due to inflation. Possibly the best analogy between RL and WOW I have seen in a long time. Nicely Done. Yor are confusing leveling up (productivity gains) with inflation (decrease in the purchasing power of your gold coin). In WoW as in real life these two effects are both occuring in the market at the same time, but that does not necessarily mean they are directly linked, and they are not the same thing. Productivity gains are always your friend, while inflation is not. In a simplified economy like WoW productivity gains from leveling up and increased dailies, could well be a significant driver of inflation, but that does not make it the same as inflation. @kotamundus: The productivity gain is the main drive of inflation. I'm obviously aware of sick hyper-inflation caused by bad national bank policies, but this is about normal inflation. Money itself is just useless piece of paper which gain value only by the fact that the people accept it as representant of the real products. Inflation represents that the new versions of the products are more valueable than the old ones and you have to pay more to gain them, and work more (or rather more productively) to gain this money. Of course one could create an inflation-free representation where the differences between old and new would be made by decreasing the price of the old. In very quickly developing markets, like computer hardware it does happens, the same brand new CPU that cost $500 a year ago is just $100 now. This scheme would have the negative psychological effect on the underperforming people that every year their nominal salary would decrease. Much bigger problem would be that this scheme would encourage "keep it under the pillow" investments, since if you have the price of the best car available today, you can keep that money under the pillow for a year and buy the best car of the next year. With inflation you must invest your money at least into state bonds to keep its value. This way you are forced to do something useful (helping the liquidity of your currency) and you take some risks (if your country goes after Iceland, you lose your money), therefor you are encouraged to prevent it happening. I think i am forever doomed to be a qust/dailies type of guy for earning gold /sigh. The inflation has also a quite benficial effect on AH players: it reduce the deposit/buy out ratio. The deposit fee is based on the vendor selling price. I dont think it was ever adjusted and I don't think it will since it also provide a normal progression for questers. A lower deposit/bo ratio allows AH players to list their items higher in the market value spectrum. The extra money made when the item sells will compensate for the extra deposit fee caused by relisting the item. I do still disagree to some extent about the economics of Wow being different than Real life in significant ways. However both our blogs are about Wow (although different facets). I believe that while Wow reflects life to a large extent there is a difference in that it is a closed economic system with no real room for innovation. The biggest difference however is that there is unlimited room at the top level of earning. In Wow there can be a whole server full of level 70's, however in RL you can't have a whole work force full of CEO's. @dechion: you are mostly right about the innovation which is an important drive in real life. In WoW the players cannot be innovative since they can just reach the opportunities the developers created. However with content patches the NPC-s are innovative in some way buy offering new recipes, new resources. The CEO part on the other hand is a quite different issue and inspired a new post. Thanks. This is a late post I know. I was thinking about your analogy with inflation with WOW mostly I agree, except for the car time machine part. I have an example that is an exception to you rule. My grandpa bought a general purpose tractor around 40 years ago. The value of the equipment has roughly kept in line with inflation because it has been kept in very good condition. The value is also similar to other much younger tractors that do the same job. Refering to you statement: "the new versions of the products are more valueable than the old ones and you have to pay more to gain them"
My thinking is more, we are getting paid more thus we can afford to pay more for products. Where I work I know that we get a pay increase of around 4-5% pa, with the only bases for this is to keep our pays inline inflation. My suggestion is that its the employers themselves that are driving inflation by paying people more for no increase in productivity. If every employer stopped increasing peoples pay in this way wouldn’t it also keep living expenses from rising?